This card was created for the SCCSC79 sketch challenge on Stampin’ Connection. 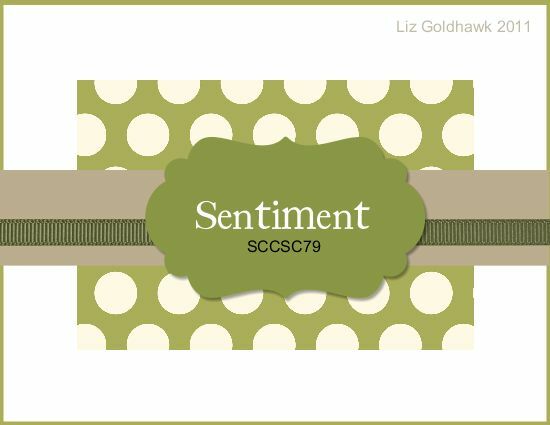 Accessories: Cherry Cobbler ½ Inch Scallop Polka Ribbon, Basic Rhinestones Jewel Accents, Lots of Tags Label 2, Stampin’ Dimensionals. The card base is 5 ½” x 8 ½” Pink Pirouette cardstock that was scored at 4 ¼”. The card front was stamped with the Delicate Doilies stamp set in Pink Pirouette ink. This gives the card base a nice, yet simple pattern. Next a piece of Flirtatious DSP was cut at 2 ¾” x 3 ¾”. This was adhered to a 3” x 4” piece of Cherry Cobbler cardstock, and the panel was adhered to the card front. A piece of Wisteria Wonder cardstock was cut at 1” x 5 ½” and was adhered to the card front. A piece of Cherry Cobbler ½ Inch Scallop Polka Ribbon was cut at 11”. Using Snail adhesive I adhered the end of the ribbon in the center of the Wisteria Wonder cardstock strip right where I want my label to go. The ribbon was wrapped around the card front and the other end was adhered to the Wisteria Wonder cardstock. The label was cut in the Big Shot using Whisper White cardstock and the Lots of Tags Label 2 die. The greeting from Bring on the Cake was stamped in Cherry Cobbler cardstock and the label was adhered to the card front with Stampin’ Dimensionals. Three rhinestones were added to two of the corners of the DSP to add a little bling. Gotta love that bling! That’s it. The color combo came from the Color Coach. It’s not one I would have come up with on my own, but it works. If you are a Stampin’ Up Demonstrator you can find the sketch challenge thread HERE. If you are not a Stampin’ Up Demonstrator I would still LOVE to see your creations. Please post a link to your project in the comments section of this post!